If you’re ready to retire, but not ready to downsize, The Ridge in Courtenay should be your choice for building a new custom home. Build your home in this master-planned community, with over-sized lots featuring ocean and mountain views. The large lots provide privacy and room for carriage homes or in-law suites – plenty of room for aging parents, visiting grandchildren, and all of your friends who will be eager to experience the Comox Valley. New, custom-built homes in this new community start at around $430,000, which includes the lot and landscaping. Choose to work with our preferred builders and see how easy a custom build can be. And enjoy the savings - the average cost of a home here is 50-75% less than in Metro Vancouver. While surrounded by nature, the City of Courtenay is home to all of the amenities you would expect in a big city: major retail centres, businesses, North Island College and recreational facilities. The new Comox Valley hospital is currently under construction, and Comox Airport (YQQ) connects the community to Western Canadian hubs and beyond. Crown Isle is Building Community – One Bench at a Time. The 1st Phase of Crown Isle Resort and Golf Community’s bench program is now complete, with 6 benches installed throughout the community. These benches are designed to provide resting and meeting spaces along popular walking routes throughout the community. The benches were provided by donation from residents, Crown Isle Resort and builder Benco Ventures, as well as the City of Courtenay, which provided the concrete pads and will maintain the benches. This joint venture is proving popular already, and Phase II is in the works. Residents can make donations for the next phase through City Hall. The bench program is just one of many examples of what makes Crown Isle a true community, full of amenities that go far beyond the championship golf course and resort centre. 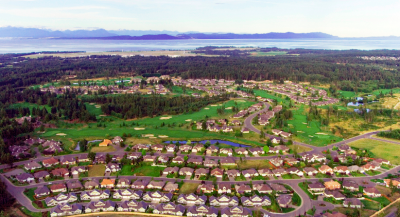 If you’re ready to be part of the fabulous Comox Valley community, contact Crown Isle today to learn more about building your next homes here! Real estate prices in major Canadian cities continue to climb out of reach of many families, but smaller centres such as the Comox Valley on Vancouver Island still offer excellent value. With new custom homes at The Ridge in Courtenay starting at only $430,000 (complete with the lot and landscaping), new family homes here are 50-75% less than homes in Metro Vancouver! Living at The Ridge in the Comox Valley provides great value and fabulous lifestyle! Enjoy larger-than-average lot sizes, many with ocean and mountain views, and zoning for carriage homes and legal suites, all within city limits and just minutes from downtown. The Ridge is a master planned community, designed with community amenities including walking trails and a pond. The Comox Valley serves as the retail, transportation and education hub for northern Vancouver Island, with a great mix of major retailers and local businesses, an international airport (YQQ) and BC Ferries terminal, and the main campus of North Island College. A strong public school system and Air Force base are major employers in the community, which is famous for its moderate climate and year-round outdoor activity options. Enjoy golf, skiing, boating, biking and so much more! Take in all of the best of Vancouver Island living from your new home at The Gales in Ladysmith. These luxury patio/town homes feature top to bottom luxury - every detail is taken care of by award winning GNB builders - from the ocean view balconies and patios, to the luxury finishes throughout. And it's all designated Built Green® platinum. 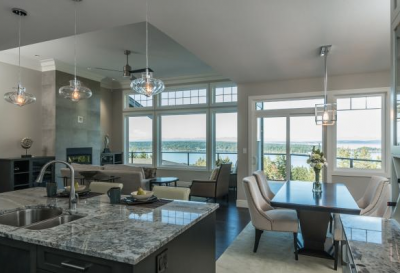 Homes at The Gales in Ladysmith feature dramatic styling, luxury finishes and wide open spaces reflect the spectacular ocean and mountain from the community. Stop in today to tour the current show home at The Gales - a 3,000 sq ft home with an open floor plan designed to take full advantage of the ocean views. Construction is also underway on another new home at The Gales. Multi-award winning GNB Builders, winners of the 2016 Single Family Production Home VIBE (Vancouver Island Building Excellence) Award, are building this new home, which will feature space for all the big toys, and the refined finishes The gales are known for. Prices for new homes at The Gales range from $519,000 to $639,900. The Comox Valley has seen a boom in real estate sales this year, with no slow down in sight even as summer draws to a close. A busy market requires both buyers and sellers to use the the guidance of an experienced Realtor to get the home buying and selling experience they deserve. Multiple offers on listings are occurring more often - even in smaller communities such as the Comox Valley, and Realtors are also seeing offers over list price as buyers compete for the limited inventory. With fewer homes on the market, but demand still high, Art Meyers, Realtor with Royal LePage in the Comox Valley is working with his sellers to get tomorrow’s prices for today’s listings. He is able to get top dollar for his clients, as he keeps his eye on the rapidly changing market. With more than 40 years of experience in the real estate business, he is one of the most successful and experienced Realtors serving Comox, Courtenay, the Comox Valley and Cumberland. Call Art today for your free Comparative Market Analysis. In the middle of Vancouver Island in Courtenay, owners of the Crown Isle Resort and Golf Community have started roadwork and servicing for The RISE - Phase II. Phase II will consist of 28 new building lots and 3/4 of the lots have already been reserved by future homeowners and local custom builders including Homes by Crown Isle. Lot prices in Phase II start at $170,000. Numerous homes are now under construction in Phase I, where just two of the original 27 lots remain available. Moving to the Comox Valley means more for your real estate dollar, compared to most major Canadian cities. 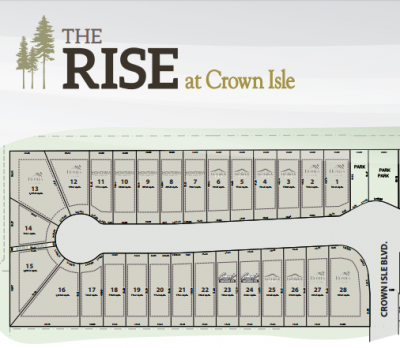 New single family homes in Crown Isle start in the mid to high $400,000s and go up to, well - the sky's the limit! Here you can afford to live a luxury lifestyle in a desirable neighborhood. All this and you are also walking distance to the Comox Valley Aquatic Center, the new Comox Valley Hospital, North Island College, shopping centres, banks, offices, restaurants and more. Don't miss out on this exciting new real estate opportunity on Vancouver Island. If you could build your dream home on Vancouver Island, what would it include? If these are on your list, you'll find it all and much more at The Gales. 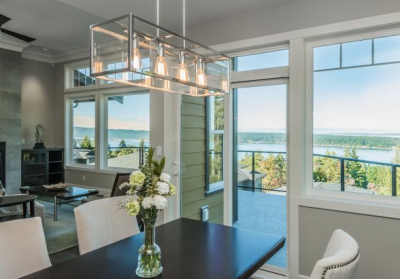 Homes at The Gales in Ladysmith feature dramatic styling, luxury finishes and wide open spaces reflect the spectacular ocean and mountain views of the development. And this 68-home community also boasts Built Green® platinum designation, confirming their commitment to environmentally sensitive construction techniques. Stop in today to tour the current show home at The Gales - a 3,000 sq ft home with an open floor plan designed to take full advantage of the ocean views. Construction is also underway on another new home at The Gales. 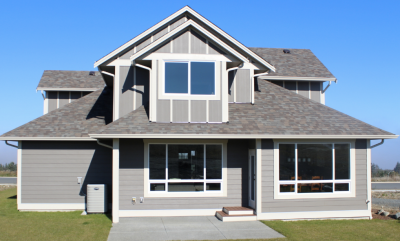 GNB Builders, who recently won the the 2016 Single Family Production Home VIBE (Vancouver Island Building Excellence) Award, is once again building The Gales' next ocean view home.